Live well. Retire with more. Rebalance 360 bundles world-class investing, financial planning and decision-making advice into one high-value, low-cost approach to your complete financial life. long term, the short term, and all the moments in between. Rebalance 360 helps get you there. Rebalance 360 includes advisory service that help make sense of even the most complex of financial decisions, empowering you to enjoy more and worry less. help you maximize your money for what’s important to you today, while making sure you’re ready for life’s next act. Three powerful services, one transformative approach. Invest 360 offers the same low-fee, tax-efficient, globally diversified portfolios used by the investing elite, but designed for everyday life. To help grow your wealth for the long term, short term, and everything in between. Our Plan 360 service provides a simple, powerful financial roadmap, tailored to your specific goals, showing how much money you can spend on your journey and how much you’ll have left when you arrive. Our Advise 360 services draw from our deep bench of great industry minds to help make sense of even the most complex of financial decisions – empowering you to navigate your specific life with confidence. What do you get when you combine world-class investing, financial planning, and decision-making together with low fees and best-in-class advisors? 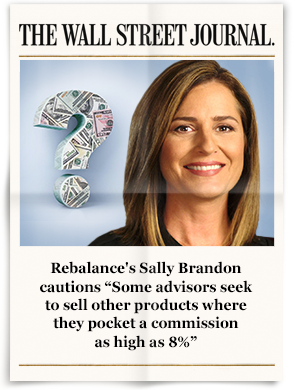 You get Rebalance 360 — the high-value, low-cost solution to your complete financial life. At Harvard, Mitch Tuchman and Scott Puritz were united by an idea that there had to be a better way to help everyday Americans live well and retire with more. That idea has become their lifelong mission. That idea is Rebalance. Three luminaries. A shared belief. 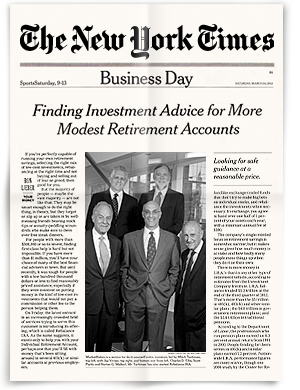 Burt Malkiel, Charley Ellis, and Jay Vivian are some of the most respected voices in the financial industry. Together they share a belief that everyone, not just the wealthy, should have access to high quality financial services. Naturally, they lead our investment committee. Hear why they joined Rebalance. Rebalance Named 2018’s Most Innovative Wealth Firm in U.S.!